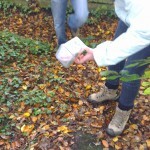 Today I went on my first geocaching experience. For those that don’t know, a geocache is a container that is hidden somewhere in the world. It has coordinates assigned to it and then using these coordinates (or an app) people go and look for the boxes. Inside the box could be a number of things, but usually there is a notepad to sign to show you found it. Why did we do it? I’ll come back to this later. We started with getting an app. I used the official geocaching.com app called Groundspeak. This is £6 which in app-world, makes it very expensive, but consider the fact that I was out and about using it for two hours today and it only cost me £6. Plus I get to use it over and over again. It is well worth it in my opinion. Once we found the app, we found some friends who had never been before and they came along too. 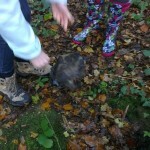 We looked for caches in their local area and went exploring. Our first was a 1star (everything is out of 5) difficulty so it seemed perfect to start with. 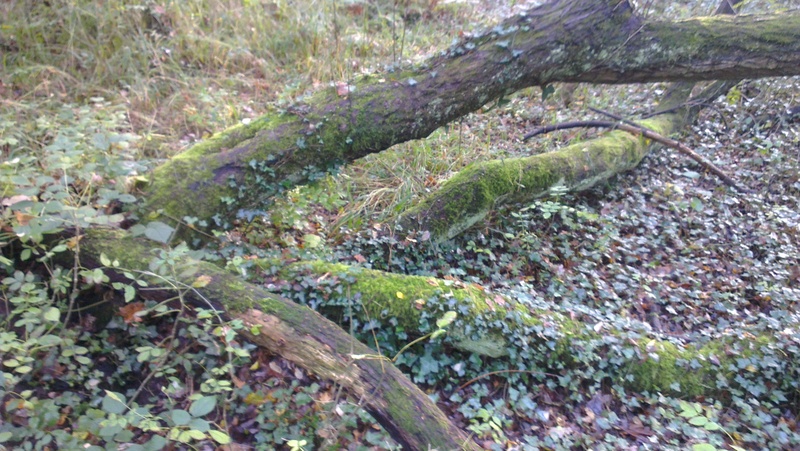 They also knew the coppice it was in so that gave us a bit of a head-start. Apart from the coordinates, the only clue we had was ‘Under the snake’. So we chose the cache, set the compass and walked. Of course we weren’t just treasure hunting, we were spending time with friends and being outside too, so it’s all good. After a while we found the coordinates, the compass helpfully counts down until you are a metre or so from the mark. We saw a wooden bench carved to look like a snake. We tried lifting it, rolling it and generally looking around it until we saw a large stone. Although when we picked it up, it wasn’t a stone but one of those ‘hide your keys’ stones. Inside the ‘stone’ was a money bag with a rolled up piece of paper. We signed it, put it all back and chose another one. 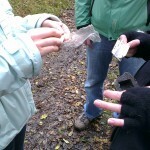 For the next cache, we upped the stakes to a 1.5 star difficulty and we walked the 500m or so to find it. It took around 10minutes to find as the clue wasn’t that helpful and it was hidden in a ditch. This cache was bigger (2/5) and was like a small lunchbox. Inside were a few small objects and geocaching rules state that we could take something provided we replace it with another object or equal or greater value. The third cache was 2.5/5 and was MUCH tougher. First we had to follow the coordinates and they led us to a gate. There was a question about how many rivets were in the gate. Depending on the answer, you then followed one of three new coordinates. 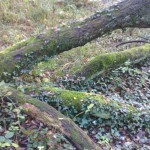 Once there, you would see a tree and the question was “how many trunks emanate from the main one”. Counting 8 we could then use these clues in the final coordinate to find the last cache. We had some coordinates e.g. N50 51.A56 and the A related to the number of rivets in the gate. 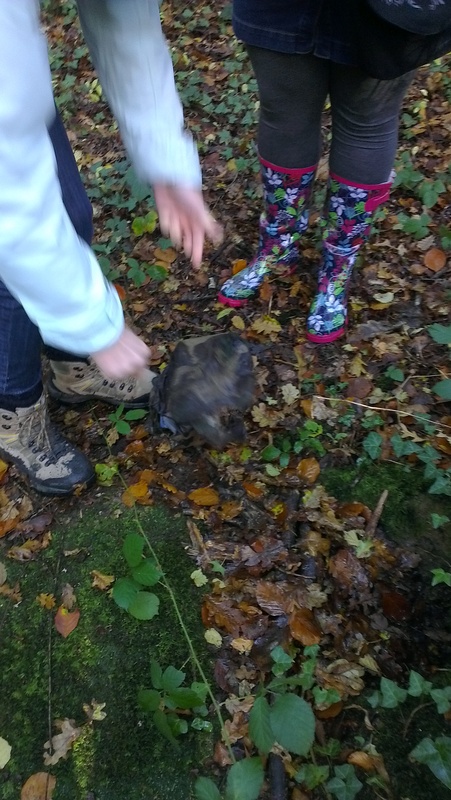 We had to go off the main path into the woods, but soon found a camouflaged bag containing a larger tub. Inside, another logbook and another range of goodies. Altogether we were out for about two hours and definitely worked hard enough to get some lunch at the pub. So, back to the question of why. Why did we do this? 2) For a school project. There are a few steps to this project. 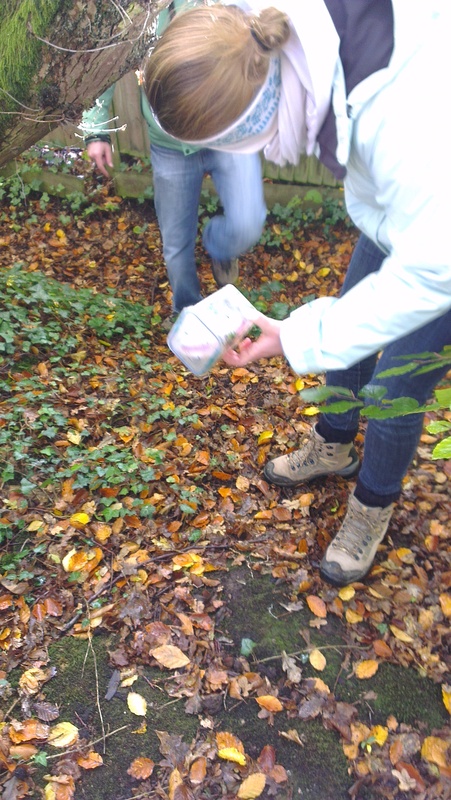 The first is to try and place a few private caches (not available on the geocache website) around our school grounds for the children to hunt and explore. They will use our Blackberry Playbooks and the coordinates to hunt them down. The great thing about the Blackberry app is that it doesn’t require WiFi or 3G as it just uses the coordinates. 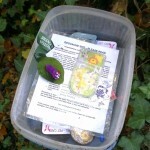 The second step is to leave our own caches with descriptions, be devious with clues and so on. Think of the writing opportunities when we write the descriptions! The third step is as part of our local area topic in the Spring. 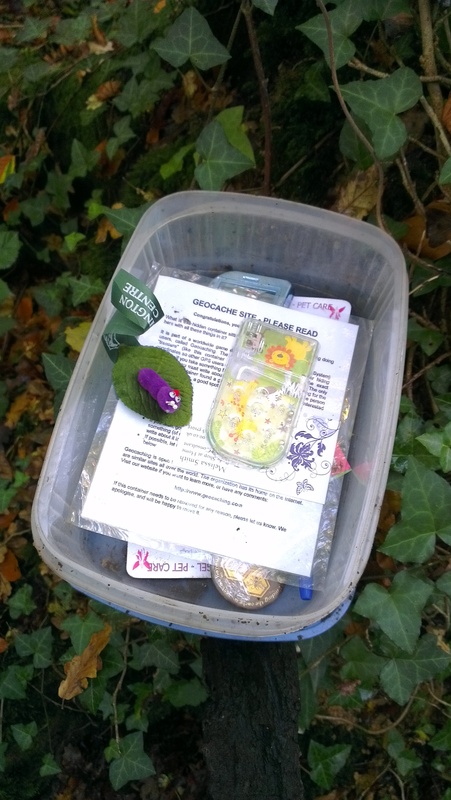 We could leave geocaches all over the village. That’s as far as I’ve thought so far…but I will keep going with the idea later! 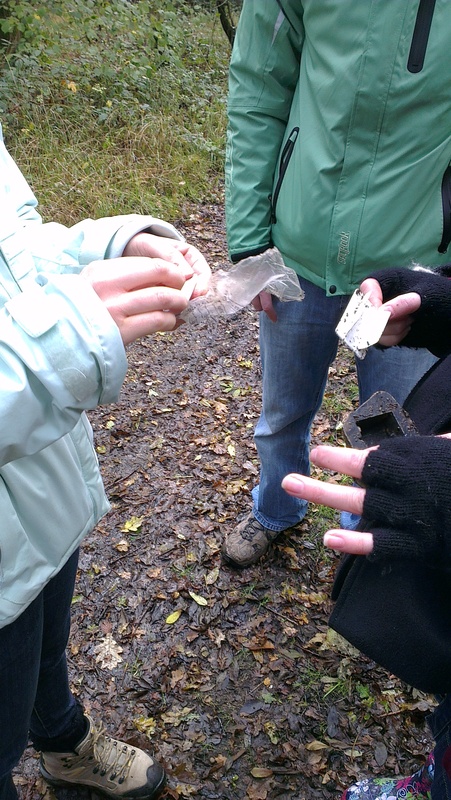 Anyway…if you’ve never been geocaching, try it. Spend £6 on the official app or download a few cheaper alternatives. Start local, the nearest cache is 80metres from my house. Take a pen, notepad and a camera. Have fun. Absolutely LOVE geocaching. The opportunities in school are endless, particularly for maths, science and geography. Even if you haven’t got the equipment for “paper-less caching” (such as with an app or online map tool) you can get the kids to draw a scale map of the school on squared paper. There’re your co-ordinates. Hide some stuff and note the positions (or the Lazy Teacher would get each group of kids to plant some caches and note the position) and then the kids attempt to find them (or each group swaps co-ordinates and finds the caches). You can link it to topic with questions that require children to research a number to do with the topic to fill in a co-ordinate (similar to your gate one Ian). All it takes is a teacher with some guts!